We arrive in Burgenland at last! 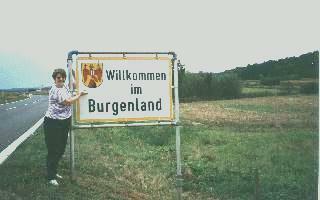 After nearly 24 hours since we'd left Sherry's house in Conn., we were ecstatic to finally see the sign welcoming us to Burgenland. At first neither one of us could get our cameras to work, but after fiddling with them for a couple of minutes, everything was fine. By the way, this is Sherry.